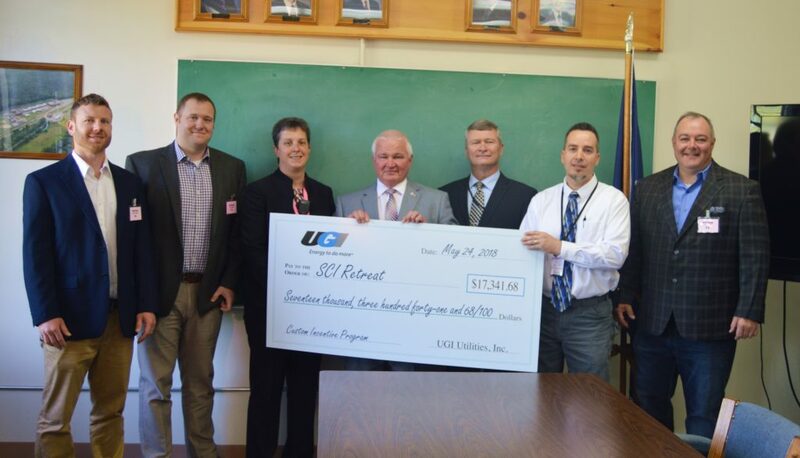 The Pennsylvania Department of Corrections received an Energy Efficiency and Conservation (EE&C) rebate check from UGI in May for installing new lighting equipment at State Correctional Institution – Retreat (SCI-Retreat), located in Hunlock Creek, Luzerne County. The rebate – $17,341.68 – was issued through the Custom Program provision of UGI’s Electric EE&C Program. SCI-Retreat converted 47 perimeter security lighting stations to LED lighting, anticipating a savings of more than 144,500 kilowatts of electric usage annually, with a reduction of nearly $16,000 on the institution’s annual electric bill. “Installation of innovative, energy efficiency technology at this government facility and other similar projects at state facilities across UGI’s service territory translates to taxpayer savings,” said Robert Stoyko, UGI’s vice president of customer relations, who noted that this LED project is the second phase of SCI-Retreat’s lighting retrofit. The first phase converted 21 perimeter security lighting stations to LED lighting in 2016. In 2012 UGI implemented the first phase of what is now called the Save Smart Rebate program, by offering commercial and residential rebates to our Electric customers. Program incentives were put in place and expanded in 2017 to UGI Gas customers and then in 2018 to UGI PNG customers, under the name Save Smart Rebate Program. The goal in offering these programs has always been to offer commercial and residential customers with rebates to incentivize the installation of high efficiency products, thus saving energy and money. UGI now offers a comprehensive list of rebates and energy saving programs to both our commercial and residential customers. Offers range from a $100.00 instant rebate on an ENERGY STAR® Wi-Fi thermostat to a full home or business energy audit, at a deeply discounted rate. For a full list of program and equipment qualifications, or to apply for a rebate online, please visit https://www.ugi.com and click on Ways to Save. At UGI, we believe that safe, reliable and efficient energy is a necessity for our customers and communities. We are committed to sustainable business practices and growing the Company in an environmentally responsible way. We recognize our responsibility to pursue innovative and efficient energy solutions that benefit our communities and encourage our customers to do the same. For quick tips on how you can save energy, go to https://www.ugi.com/energy-saving-tips/ .